There seems to have been a time in every truly born-again believer's life, shortly before they gave themselves completely to the Lord, that they had very strong "yearnings of the heart", which are hard to describe, but which opened them up to receive the Holy Spirit. Mary and I have experienced these inward feelings, as did John Wesley. I can remember that drizzly overcast day as if it were yesterday. I was going on a business trip, yet my mind was filled with questions concerning the origin of all "creation" and "the existence of God". I filed my IFR (Instrument Flight Rules) flight plan and preflighted our corporate airplane. I received my clearance and read it back to the controller. I started the engine and taxied out for take-off. Almost as soon as I lifted off the ground, I entered the total wet grayness of the overcast. I was all alone (at least I thought so at the time) relying upon my skills as a pilot. Then, all of a sudden, I "broke out" of the grayness into the brightness of a clear blue sky. The clouds, now below me, were a billowy brilliant white carpet. It was as though I were no longer upon the earth, with all its problems and questions. I was set apart. I looked up into the clear blue sky and said, "God, if you're really up there, you have to let me know. I don't have any other answers." God indeed heard that prayer, for it came from the depths of my soul; but although He didn't answer me right away, over the next several months things in my life began to change: my outlook was different. And the last place a Jew expects to find an answer is in Jesus Christ; but to Him I was led by the Holy Spirit. It is also interesting to note that since that time, I no longer use a singular pronoun when referring to my flying; it's always plural, even when I'm the only "soul" on board, for now I know God is always with me. Before discussing this poem, it's interesting to note that the members of the Holy Club, as it was called then, were being derided for their faith and practice of good works. They were ridiculed and made a laughing stock and a joke; they were called "Methodists", a term that was later raised up as a banner of pride in the Lord. It is quite similar to the cross that was used to debase Jesus, yet it has risen with Him to be the symbol of all Christianity. In America, John Wesley had a chance to see a portion of the world in a mostly unspoiled condition. The whole of God's creation began to speak to his heart and soul, because he was open to receive the prompting of the Holy Spirit. Wesley came to the conclusion that we are not to "own" or "covet" any thing that moves upon this earth. All belong to God, and only to God. If we truly love God, then we will also love the whole of God's creation, and not misuse or abuse any portion of it, or any living soul (human and non-human alike). Wesley asks the Lord that if anything would lead him to covet or abuse anything upon this earth, He would tear such improper desires out of his heart. All belong to God in the dignity and righteousness that God created for us all. I never heard that anyone objected to this. And indeed who can object? Is not this the language not only of every believer but of everyone that is truly awakened? But what have I wrote, to this day, which is either stronger or plainer? "You have heard that it was said, 'You shall not commit adultery'; but I say to you, that everyone who looks on a woman to lust for her has committed adultery with her already in his heart." This is no different than if we knowingly turn our back on any evil or cruelty that is taking place in the world, and pretend it isn't happening. We then escalate the evil within us, when we participate in something involving such cruelty or evil acts, even if we do so indirectly. Let's look at one example, the wearing of fur, even as a piece of trim. We know that the wearing of fur is not necessary to our survival. There are many non-animal containing products to clothe us and keep us warm. We know that we cannot obtain an animal's fur without causing its death, and in most cases with extended periods of pain and suffering. We know that people's desire for fur is to covet it more upon themselves, than to allow it to remain upon the animals to whom God gave it as their fur coat. And, thus, we must know that the wearing of fur cannot be part of Christian perfection. 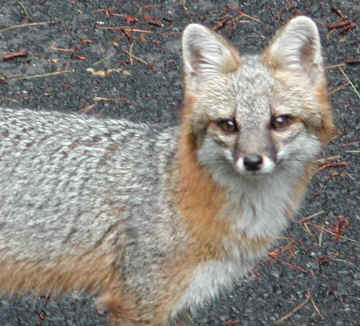 Look into the face of this fox. Is what we see any different than what we see in the faces of our companion dogs or cats? Of course not! The same life force, the same soul and spirit is in her, too. She deserves to live her life as God intended, just as we desire to have our cats and dogs live happy and healthy lives. 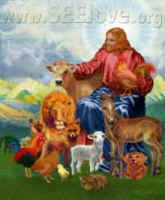 And, we should love her and all other animals in the same way, if not even more so, with the perfect love of God. There is an interesting story behind my taking this picture. I spotted some young foxes playing and I grabbed my digital camera and was photographing them, when momma spotted me. She obviously knew I wasn't going to hurt her family, so she came out in front of me; but because I was so intent on taking pictures of her children, I didn't notice her, even when she was only about fifteen feet away. So she gave a single high-pitched "bark" to attract my attention. I guess it was her version of, "Excuse me! These are my children, and I want you to know that I'm here to protect them." 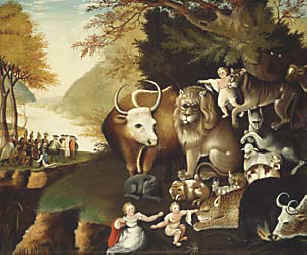 This was one of those times when I came to the realization that the Peaceable Kingdom could exist in the world today, if we truly wanted it to happen. And the yearning of my heart was, "Lord let it happen now, that even these fox and all other animals would no longer kill one another for food, and most of all, that humans would no longer desire to kill for food, fur, or for any other reason, either." In the same manner, we can have Christian perfection if we want it, but we have to really want it, and eliminate those things from our lives that prevent its fulfillment.